RAD in action in Monterey Canyon. Our oceans are home to a diverse array of aquatic organisms, a surprising number of which have yet to be discovered. 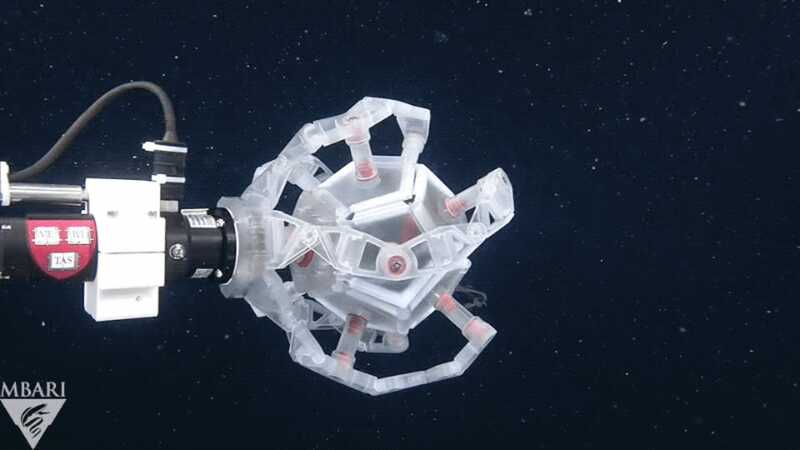 To help in the search for these fascinating creatures, researchers have developed a robotic device capable of capturing even the most delicate deep-sea animals, which it does with a foldable, 12-sided hand. Introducing the rotary actuated dodecahedron (RAD), a 12-faced device developed by researchers at the Wyss Institute for Biologically Inspired Engineering at Harvard University and several other institutions. When the RAD hand is fully extended, it doesn’t look like much—especially to an unsuspecting sea creature swimming nearby. But when it folds in on itself, RAD forms a dodecahedron cage, trapping animals inside. Importantly, the joystick-controlled device performs the task without inflicting any injury to an organism. The origami-inspired RAD is meant to provide marine biologists with a non-invasive way of extracting samples for discovery and analysis. The details of this remarkable new machine were published today in Science Robotics. RAD in its fully extended configuration. It’s estimated that around a million species are still waiting to be discovered in our planet’s oceans, especially in the deep midwater sea areas. Many of these undiscovered aquatic animals are gelatinous, and, as a result, super fragile. Conventional capture techniques, like nets, often destroy these organisms. Also, these soft-bodied animals are notoriously difficult to grab with existing underwater equipment. This is where RAD can help. RAD consists of five 3-D printed polymer “petals” that are attached to a series of rotating joints. A single motor allows the entire structure to rotate about its joints and fold up into a hollow 12-sided cage, or dodecahedron. The researchers experimented with several different shapes, but the 12-sided version worked best. The robotic device was first tested in the Mystic Aquarium in Mystic, Connecticut, where it successfully captured and released a moon jellyfish. After some slight adjustments, RAD was attached to an underwater vehicle and sent to the Monterey Canyon off the coast of California. Controlled remotely, RAD captured and released specimens like squid, octopus, and jellyfish (the researchers said the octopus was particularly curious about the device). RAD was tested at depths of 2,230 feet (700 meters), but the sampler is designed to work as deep as 6.8 miles (11 km) without imploding from the intense water pressure. The researchers are now working on a more durable and rugged version of RAD for use in more complex underwater tasks, such as marine geology and even construction projects. Looking ahead, RAD could be equipped with built-in cameras, touch sensors, and even DNA sequencing technologies. So in addition to catching sea creatures, RAD may eventually be capable of conducting its own research in the field.